Happy 4th Birthday, Daphne Jane! Wow. 4. My baby is not a baby anymore. . . and she likes to remind us that she is NOT a baby. She is a big girl. I am thankful to report that Daphne is a happy, funny, entertaining little girl. Three months ago, I probably would not have described her this way (honestly, I would have said that she was a semi-grumpy, always tired, and easily frustrated child). Daphne spent about 15 months of her little life (from 2.5 – 3.75 years old) not napping and not sleeping at night. We were going crazy with exhaustion and no one seemed to know what was going on with her. She was sick a lot – ear infections, coughs, sinus infections, etc, but nothing seemed like that big of a deal. Crazy long story short, Daphne ended up having her tonsils and adenoids removed in October. It was a rough surgery and recovery, but we are finally almost 3 months post surgery and Daphne is a totally different little girl. She cracks us up. Her goal every day is to make us laugh. 1. The biggest one is that Daphne actually sleeps through the night most nights. I really never thought this would be a 4 year old milestone! 2. Daphne is taking ballet and gymnastics and loves them both. She is always walking around in her tiptoes and twirling. She is more outgoing than Norah or Lucy were at this age. . . she actually talks to her teachers! ha! She is also doing forward rolls all over the house. 3. Daphne has suddenly become a good eater. I am sure this is related to the tonsils coming out, but hey, I will take it! She loves fruit. . . LOVES it. 4. Daphne can spell her name out loud and can basically write it. Watching her concentrate as she goes through one letter at a time is so cute! 5. She is not our tv kid. She would much rather play and pretend than watch tv. 6. She is always pretending and talking to imaginary people. . . I always think she is talking to someone, but usually no one real. 7. Daphne is FINALLY back on the growth chart – barely, but she is there! She weighs 28 pounds and is 39 inches tall. 2. Daphne (showing me a card with a picture of the Nativity on it): Mom, look! We got a Christmas card from Mary and Joseph! I bet Jesus sent it to us! Daphne: Mom, look! Bears! Lots of bears. Me: Umm, Daphne, those are cows. Daphne: I’m sure they are bears. 4. While I was attempting to clean up glitter from a project the girls did earlier today, Daphne literally stuck her face in my pile. She had glitter all over. . .on her eyebrows, lips, even up her nose. She was in the bathroom rinsing it off before I could get out the camera. 5. Mom, do I look like Captain Minnie? Cause I’m her. Really, I am! 6. Dear God, Please help me to like mommy and daddy. Help me to stay in bed all night and not wake mommy and daddy until sun comes up. Help me not wake Norah, Lucy and myself. Help me not go downstairs and look around when mom and dad are still sleeping. Help me like mom and dad. Amen. 8. Daphne never really told anyone that she was three. She spent most of the last year telling people she was some random age – age 18 and 85 seemed to be her favorite. 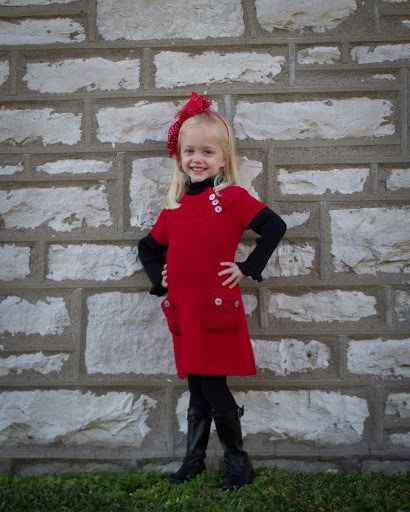 Funny thing – she now says that she is four and gets mad when the girls say she is anything other than that. Daphne is definitely a happy little girl who adores her sisters and loves life. She has been tell me recently that she “loves everything and everyone in the whole world!” We pray that her love for others never fades and that she will always show others the Jesus has for them, too!